Art, aka AA's Art, is a handsome big fawn 4½-year-old male, born June 20, 1999. Art's dam is Flying Delta and his sire is Molotov, giving him grand sires of HB's Commander and Dutch Bahama. His racing career shows 164 races at the Dubuque and Bluffs Run tracks, starting March 8, 2002 and ending October 25, 2003. Art, Dasher and Patrick ran several races together at Dubuque in October 2003, with Dasher just placing first by .10 second over Art. He is a boy who is ready for his retirement couch! Art has a sweet and affectionate personality. Art appears to be cat tolerant. 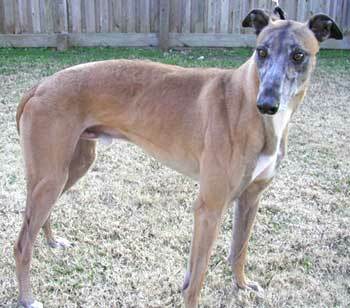 He is currently in a foster home with a medium-size dog, cat, birds and another male greyhound and is doing greyt. Art is a big, beautiful, mellow fellow. 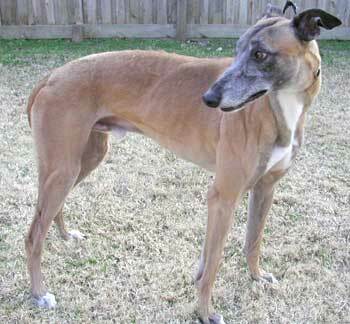 Hes cat-friendly and gets along great with the other two dogs in his foster home. Last nights storm provided an excellent opportunity to test his reaction to thunder. It didnt seem to faze him. Art is very affectionate and follows me around the house if I happen to move to another room. He is house-trained and wakes me up if he needs to go out early in the morning. The other greyhound in the house has been teaching Art to play, or at least setting a good example thats rubbing off. Art loves soft, squeaky toys for frolic and is otherwise content to chew on a ham bone or one of the softer Nylabones. Hes very sociable with dogs and people at the dog park and is getting to be more attentive when called to come to me in such a busy environment. Whoever adopts this guy will have a wonderful addition to their family.